I really truly had intended to get a real Christmas tree this year. But I created a Christmas tree forest in a crate instead. This idea just came to mind and I had to do it. With slightly twisted top branches, it’s just a whimsical take on… trees in a box. I placed 3 faux trees inside an opened lidded crate, added a star theme, with music sheet cut out stars, and called it good. 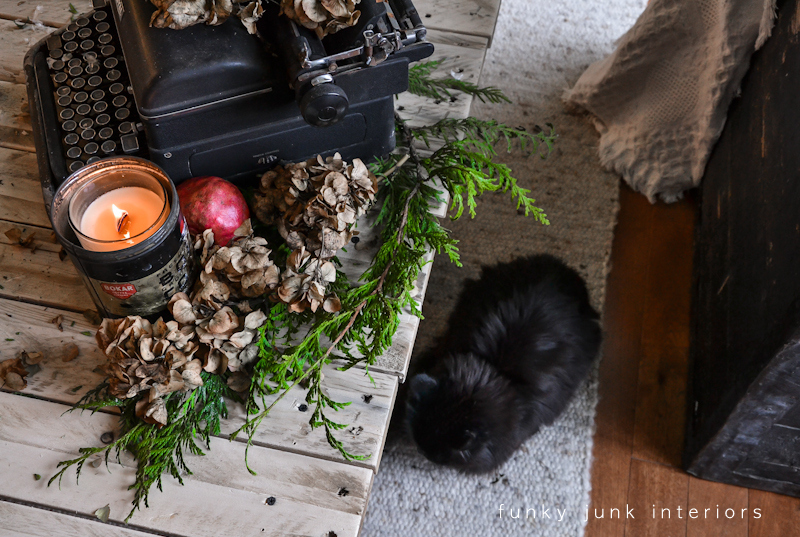 I really desired this little grouping to look as forest like as possible, so a twig garland was added to the mix. My little girl was hard at work, helping direct the way each and every branch was set. Here she’s resting on her coffee break beside the Christmas typewriter. Thanks, Teddy! 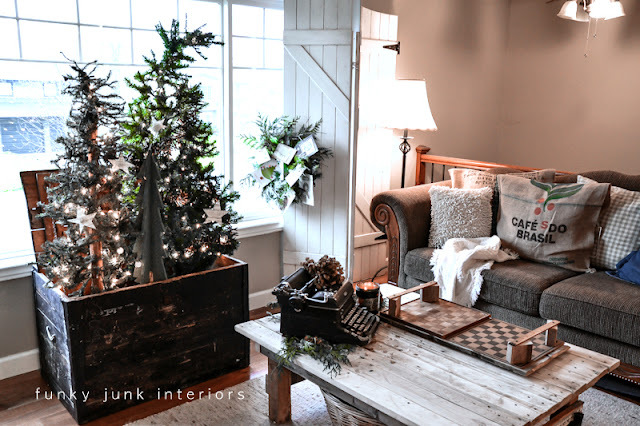 The Christmas tree forest in a crate is the perfect focal point for this direction in the room. It just works with that pallet wood coffee table, pallet media stand and old gate shutters. And I’m kinda thinking I don’t need a real tree this year after all with this year’s ladder tree and this group. Even Teddy agrees! Any bribe ideas for my boy? 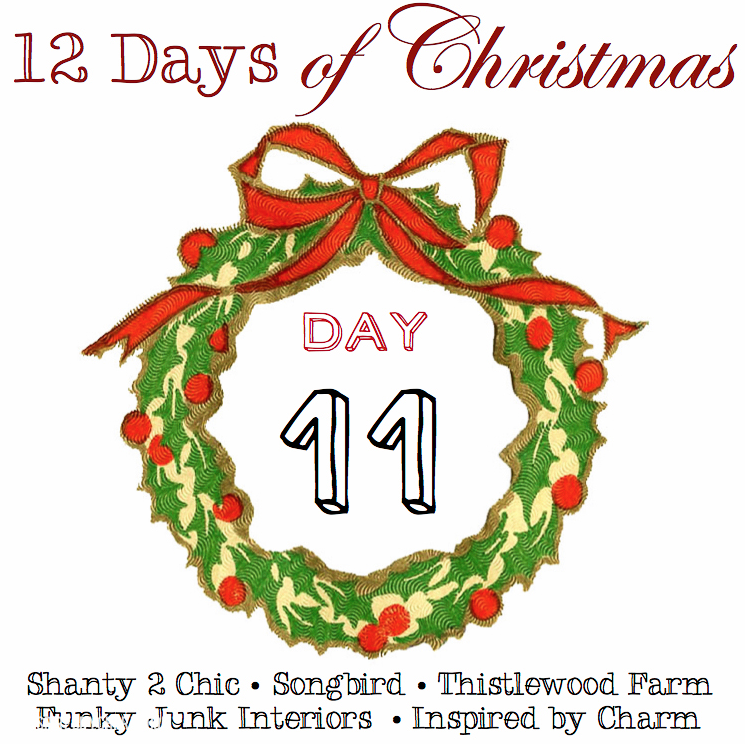 Check out the rest of the 12 day projects! See you tomorrow for Day 12! I adore your forest in your living room. Especially those crazy tops. Quirky in the best possible way. 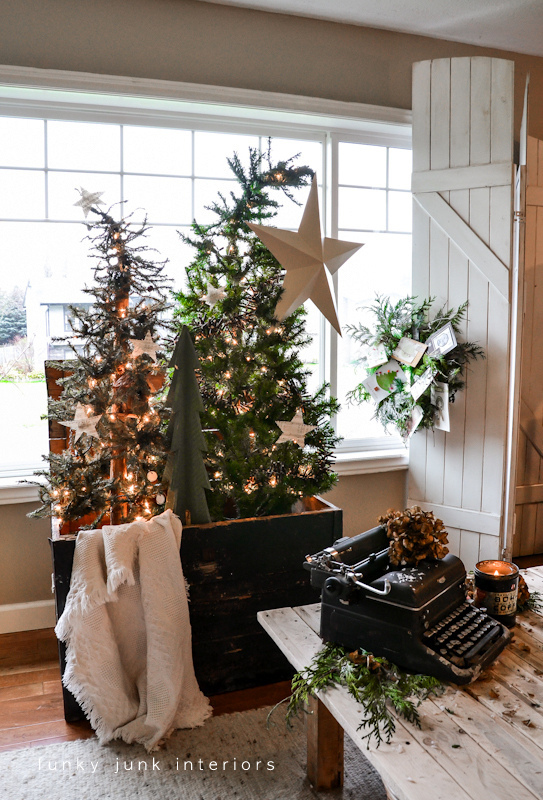 Love your ‘out-of-the-box’ tree idea! It couldn’t be more fun, I ran with my crazy idea this year too! As for the boy ~ food works at my house! I love it – its like a glamorous visit to Whoville! Perfect! 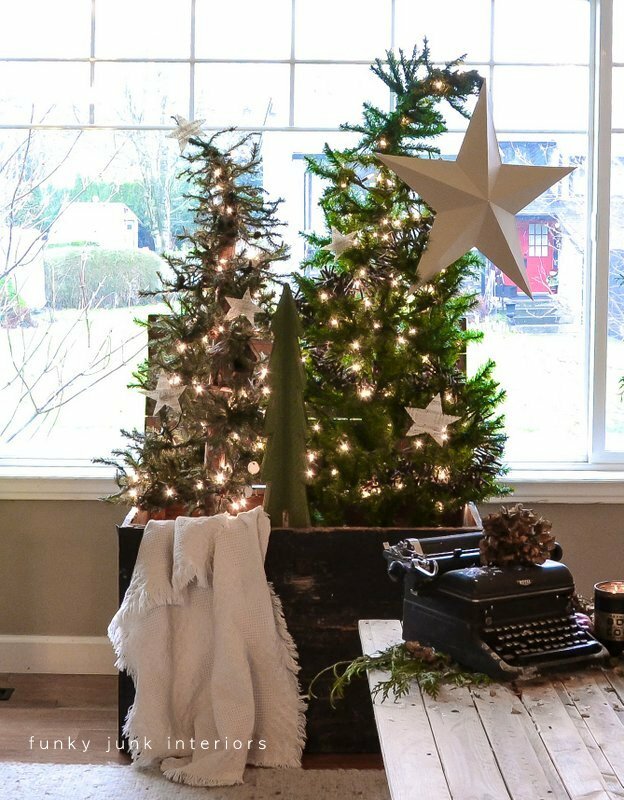 Put a small tree in his room… and put boy decor on it. Absolutely love this idea Donna! So cute!! 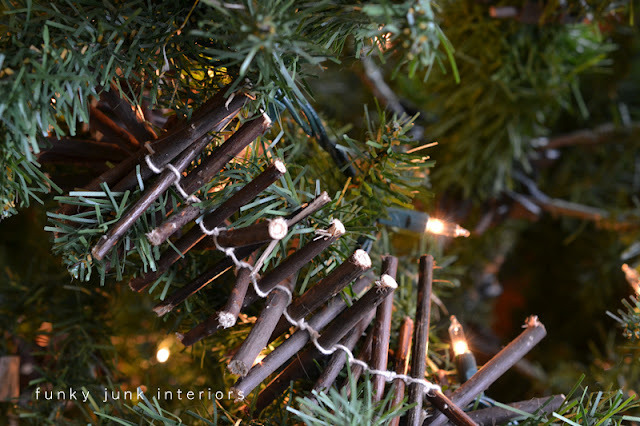 This is a perfect solution to the Big decorated traditional tree. I love this idea. So attractive. Oh Donna! As always, this is genius. And, with a ‘loo who’ tree of my own, you know I’m a huge fan of the ‘leaning tree’. Love it! Love the trees in a crate. Sometimes thinking “inside the box” works too. Love the trees in the trunk & even the wooden tree. This is so YOU. Thanks for sharing. Have a great day. Donna! It’s perfect…I love the way the star droops over! Who needs a real tree when they’ve got a forest in a crate?! cold hard cash always works!! Wow, I am in love with this idea. BTW I also love your window treatment! Those folding doors/shutters are wonderful. Our boys are around the same age. A few years ago I provided him with his own tree. It works beautifully. May the peace, joy and beauty of the season be yours. great look. i could be so happy surrounded with most if not all of yourcreations/style. As for convincing a non junk loving son. Good luck. My hsb is 100% non junky. I just love your style! Wishing you a Merry Christmas! 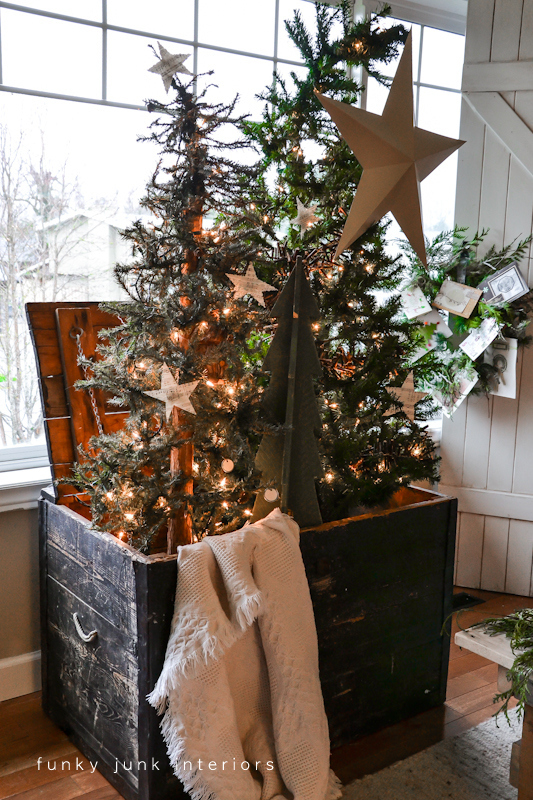 Who needs a real tree when you have a tree in a crate! I think it looks amazing! I love that star. And how did I miss those shutters? Seriously! 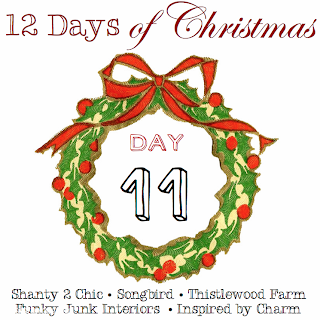 Happy 12 Days to you! Donna…your home is always so much fun to look at with all of your unique ideas. 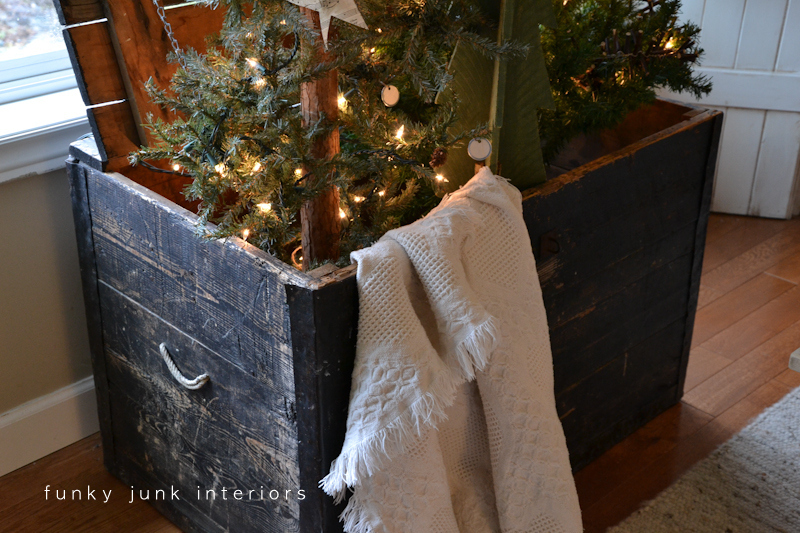 Love your trees in the vintage trunk….Happy Holidays to you! Donna I love this. I put one of my trees in a crate this year. I may try this outdoors on my porch. It might get too big though – but you’ve got me thinking. I LOVE this series! Thanks for doing it. Morning Donna, oh so magical. I love the random stars on the various types of trees. Reading the above comments, for your son, I think a tree of his own, in his room is a wonderful idea and keeping with the spirit of Christmas. I really enjoy all of your ideas. Thank you, thank you Merry Christmas. Amazing! Makes me wish I had a larger home to accomodate all of these gorgeous ideas…and I’m pretty sure I’ll be working on some twig garland soon! Your crate full of trees is wonderful!!! You are so darn creative!!! Great job! I absolutely love your crate of trees – especially how the tops are bent a little – looks so cute. love the look, and love the story line….and I am with all the above…a little tree in his room and let him decorate it…. I also missed those gate shutters. Wow! They are gorgeous, and really pull the room together. I had a little tree in my room the whole time I was growing up, and I sure loved it. Plus my Mum got to give me the plasticky, junky-in-a-bad-way ornaments left over from years before and I thought they were beautiful! Lol. I love it..The crate is awesome too..
It’s just like a magic tree coming out of a crate and it looks so beautiful. I love the whimsy!!! And since kitty approves, I wonder how long it will take her to be inside the crate to check it out?? I have my little trees in a Pear Crate and I love them!! 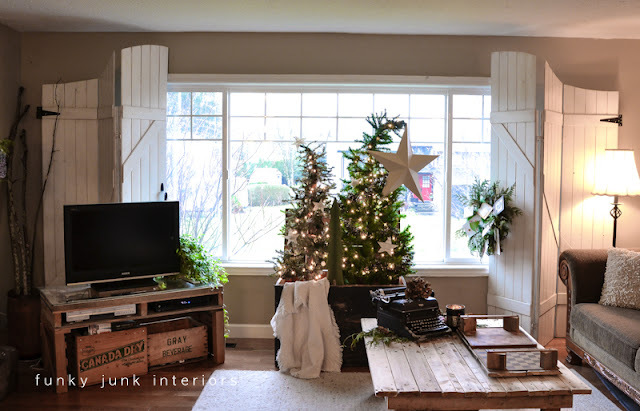 It’s been a tough year here and the I just didn’t have the energy to decorate …this idea gave me the opportunity to still have a “trees” and not use up much energy. Love it so much will probably use them this way for years to come. I sent you an email with picture hope you got it!